After his 2004 death, the estate of William W. Johnstone - under the direction of his niece, J.A. Johnstone - kept the family business alive by turning the Johnstone name into a successful fiction factory. The company hires talented genre authors to craft action and western novels published under the house names of William Johnstone and J.A. Johnstone. Unlike James Patterson’s similar business model, the actual authors are given no credit. The ghost writers are sworn to secrecy through non-disclosure agreements and the promise of future work if they keep their mouths shut about their contributions to the family business while fostering the illusion that William and J.A. are actually authoring these paperback originals. The ghost-written Johnstone westerns are pretty standard fare, but the contemporary action novels ("Treason", "Stand Your Ground", etc.) tap into the growing market of politically-conservative adventure tales marketed to the Fox News-Breitbart crowd. The formula: common-sense American heroes battle crime, immigrants, and Muslim terrorists as well as the politically-correct liberals standing in their way of success. These stand-alone novels celebrate the triumph of conservative American values over progressive societal chaos. Commercially, this formula has been extremely successful. The unknown authors would never have gotten their books into every 7-11, grocery chain, and big box store if they weren’t leveraging the Johnstone house name and the right-wing wish fulfillment thriller formula. 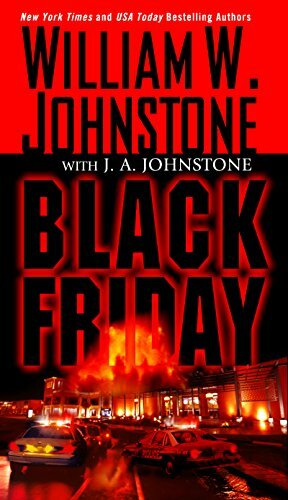 2016’s "Black Friday" is the most recent Johnstone thriller to dominate the non-bookstore bookshelves in this successful sub-genre. It’s the story of a Muslim terrorist attack on a middle-America shopping mall on the day after Thanksgiving. The unknown author introduces us to a cast of characters - several war veterans, an ex-con with a heart of gold, a Catholic Priest, a cowardly school teacher, and others - who all head to the mall on the busiest shopping day of the year. Little did the heartland customers know, but Islamic terrorists (a 100 man cell!) were planning a mass-casualty attack that day at in the name of Allah. Things quickly devolve into a barricade situation with the cartoonishly inept law enforcement outside (paralyzed by their politically-correct bosses) while a core group of hostages, armed with their own weapons and those taken from a sporting goods store, mount a stand. Politics aside, this is an excellent action novel. Think of it as “GOP Die Hard in a Mall.” There is plenty of blood-spurting violence throughout the book. The heroic characters were well-developed and sympathetic, and the bad guys were all suitably reprehensible. The unknown author did a fantastic job of moving the plot forward from one violent set-piece to another. The novel’s conservative politics didn’t detract from the quality of the adventurous tale conceived by the author. At worst, they came off as a distraction when awkwardly shoe-horned into otherwise great scenes (one character growls, “Thank God for the Second Amendment” as he’s raining bullets on terrorist intruders, for example). There’s nothing factually incorrect about that sentiment given the context, but these asides can take the reader out of the story for a moment - a disservice to the suspenseful sequence underway. As with many propulsive action stories, there needs to be some suspension of common sense and disbelief. Mall anchor stores tend to have more exits than the author allows. And a law enforcement response in real life is (thank goodness) way better than this fiction depicted. But why quibble with a Walmart paperback? "Black Friday" is a truly exciting and violent book that will please fans of classic 20th Century Men’s Adventure literature. If you find the occasionally awkward conservative talking-points bothersome, just remind yourself that this book is filed under fiction, and enjoy the thrilling ride.